The UK newspapers are at their best when they parade their left-wing 'anti-capitalist' credentials by giving away their front page to the opinions of one of the most ruthless and opportunistic market speculators in living memory. Brexit voters should be aware that there will most likely be some financial backdraft from exiting the EU. It will make a lot of people, very, very angry. You have to remember that big business, big banks and big financial investors have poured millions, or billions, into the EU project and the UK's incorporation into it. They don't want too see all that money they spent, all that time they spent, all that energy, all those meetings, all those dinners, all those hours and hours of work going into their empire building dream, to have been a waste of time. Think of all those politicians whose original protestations to the EU were either bought off or dined off, or promoted off. You have to hand it to The Guardian, though. When they have failed to win an argument about the EU, its ambitions of an 'ever-increasing union', its inherent 'democratic deficit', or even its economic success for the people of Europe, they make one last ditch effort to convince the British by at last telling them the truth - that the argument is futile because their real political masters - to whom even The Guardian bends the knee - reside neither in Brussels, nor in Parliament because their political masters are, in fact, their financial masters, the masters of the stock exchange, who, in a single day, can make a bread-basket out of a nation associated with economic prosperity. Nobody votes for George Soros. Nobody votes for David Rockefeller. Nobody votes for Lord Rothschild. Nobody votes for Goldman Sachs and JP Morgan. Nobody votes for banks and financial cartels or shadowy megalomaniac tyrants dressed up as 'progressive' philanthropists. Finally, at long last, The Guardian admits that the real Government runs the oil trade, the diamond trade, the gold trade and - in all likelihood - the drugs trade. You defy that Government at your peril. It just so happens that the EU Referendum debate has made it much easier to distinguish between those who are, at least in high ranking positions - the puppets of the financial masters of our age and those who have decided to at least maintain some kind of healthy independence from them. So, it was nice to read yesterday that that bastion of anti-capitalism, The Guardian, gave the arch-capitalist, Hungarian-American business magnate, 1 per-center, billionaire and world renowned 'progressive' philanthropist, George Soros to put the question to the British people: Would you rather be poor and free, or rich and slaves? Well done, then, to The Guardian, for finding someone well-versed in political discourse, a major player on the world stage, someone in a prime position to counsel the public on the grave consequences of this vote, someone prepared to tell the truth about this Referendum to the British people and to ask them a question far more profound than the one with which we will be presented when we vote tomorrow. I suppose we should not - given the political leanings of this long-standing newspaper - be terribly surprised that the person to put the question is...not even British. 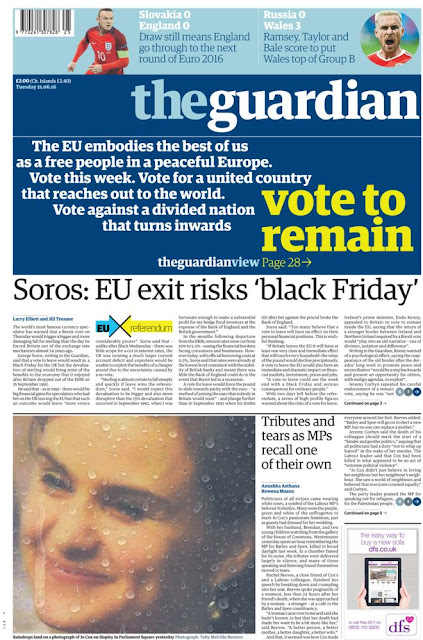 Mr Soros: You'll almost certainly never read this. You might own our derivatives. You might own our assets. You might own our stock. You might own swathes of our land. You might own our politicians, our press and you might even own our Pope. Soros is well named. Tsures - צאָרעס, the word means "misery"
The Soros intervention could well be construed as an attempt to manipulate the market. No change there then! "left-wing 'anti-capitalist' credentials...You might own our politicians, our press and you might even own our Pope...But you don't own..."
If anyone reading these lines believes any of the aforementioned has ever been authorised by a true Pope, think again. Mr Bones evinces a spirituality couched in the 'tolerance' of the New World Order. Sacrifice and pray the Rosary.